Hi, everyone. I bought a panel to use for the middle of a baby quilt, and when I got it home, I thought it had been cut crooked. However, when I hung it on my design wall, I noticed that the reason why it was cut crooked was because it's printed crooked! The entire thing is crooked. It looks ok as far as the print not being distorted but now I'm not really sure how to square it up to make the panel usable. The only thing I can come up with would be to border it with black fabric (the background in the panel is black) and then square up the entire piece. Of course then, the border would look off. Is this panel "fixable", or would you just skip the panel entirely? If I had known that there would be a problem with it, I wouldn't have bought it, but this particular quilt store pre-cuts all their panels and just pulls them out when you want to buy one. Next time I'll know to check it before I leave the store. But for now, is this panel salvageable at all? I am so glad you asked this question. I'm not sure how to fix it but I am looking forward to the ideas to come. You can try blocking it: Dampen it then pin it down, squaring it up as you go. If you have carpeting, that's a good place to do it. USE STAINLESS STEEL PINS! You don't want to have rust spots. When it's dry, it should remain square. The only caveat is if you wash it again, it will go back to it's original shape, so you will need to quilt this one heavily. Just about every single panel is THAT way. I have done what you say and once the entire quilt is done---it is not very noticeable. We notice things because we are quilters and super picky about our own work. I have also put a border around the panel and then square it up. Will see if I can find an example of that. Could you use a wedge-shaped border? 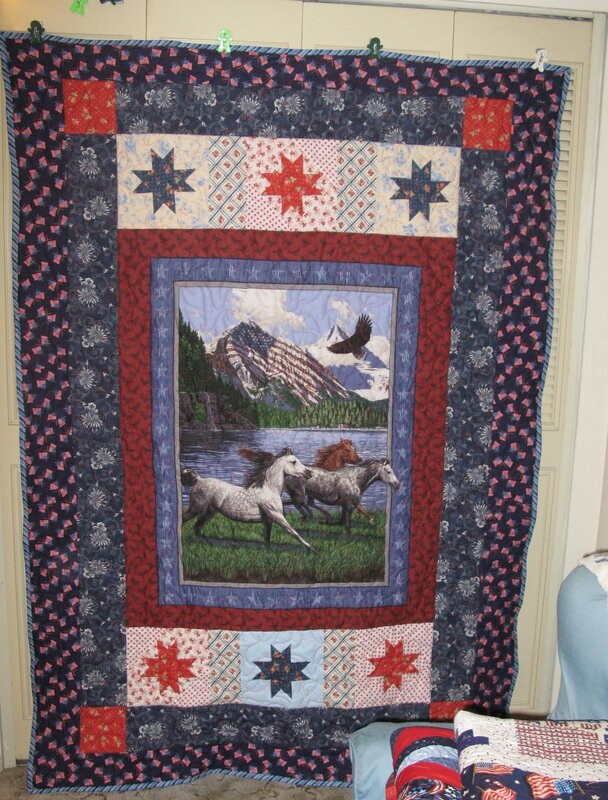 I did the sashing for a baby quilt made from a fabric book panel like that because they were not square. Make sense? Sorry don't have pics of that one! I prewashed 4 panels of fairy flowers that had about 15 fairies per panel...I'll never prewash panels again. Each was wonky. I added borders and squared up each before adding to the quilt. It showed, but my 6-year-old granddaughter doesn't notice it and was thrilled with the quilt. With a larger center panel adding borders and squaring up shouldn't be quite as noticable as with smaller squares, unless it is way, way wonky. unfortunately more often than not panels are printed crooked- something about how the fabric rolls through- the process...very seldom will you find one that is actually straight- you can try to straighten it some- depending on how 'off' it is- you can tug on it holding diagonal corners (like top right, bottom left) stretching the bias, and pressing- sometimes that works, sometimes the best thing to do is either trim it square or frame it & square it- generally once you use it the wonkiness is not noticeable. Thanks for the suggestions and replies. I guess this a very common problem, and it might preclude panels from my future quilting projects. That's a bit disappointing, isn't it, because there are some really cute panels out there. Anyway, the print goes "off" about midway down and it's more than an inch off from that point to the bottom of the panel. I think what I'll do is just cut it apart (there are three "sections" to the panel) and use it to make a two-sided quilt. I'd also purchased a pack of 5" charm squares to use in the quilt so I'm just going to sew those together to make a square-ish top and then use the panel with some other fabric for the other side. This is one of the main reasons I don't buy panels. I bought some cheater fabric and none of the blocks are square - I bordered each block with another fabric then squared them. No one even notices the blocks aren't square. That is the issue with most panels and cheater blocks. If the panel was pre-cut at the quilt store, you should be able to return it if you don't want to deal with it. I've also struggled with panels that aren't printed straight, or even designed to be straight. Sometimes I think they're more trouble than they're worth. I am currently working on one that was 4" inches shorter in width across the bottom that at the top!! Thankfully, it was something that I could cut and square up or I would've just used the fabric for something else later. But since I had to cut off so much from top, I've had to add a much larger border than planned. This resulted in not quite enough fabric and, of course, there is none left. So I've not had to add some corner blocks of another fabric. I'm hoping that all this won't be too busy!! I'm with you - all fabric will be better measured after it is cut but before I pay for it (especially if grandma at the LQS cuts it). Love that lady - really I do and I'm glad she is able to work some but I'm learning to watch her closely. She overcharged me for a template the other day and undercharged me for a marking pen. Don't think she and the computer at check-out are very friendly yet But again, I'm glad that she is able to contribute to the family business and she is a wealth of knowledge and ideas!! Last edited by nativetexan; 07-07-2013 at 02:32 PM. I would wash the panels, dry them, and then see just exactly what I'm working with. If the design is printed off-grain, no amount of pulling, etc. will get it on-grain. I would salvage what I could of it, and then rework it - if I still wanted to fight with it. Have you considered returning it to the store? I'm a fanatic about working with the grainlines running in the intended directions. Again, thanks for the replies. I won't return it to the store because a) it's not their fault the manufacturer can't figure out how to print straight; b) it's a fair drive (1.5 - 2 hrs, depending on traffic) to the place for a $7 panel, and it's unlikely I'll make the trip again any time soon; and c) despite that, it's still my favorite quilt store in the Houston area. When I go over there, I usually drop a few hundred dollars, so I know it's not that they'd be upset with me, but since I have made two trips to that side of town in two weeks, I probably won't make it back for two months at least. I've decided to use the panel with modifications, and I think it will work. I just need to come up with some fabric to make up for the missing bits (isn't that always the case?). If I don't already have something in my stash that will work, I'll either just order something online (the quilt stores on my side of town aren't all that great) or I'll dye something. Could be worse, because after staring at this thing for a day and a half, I think I can work around it. I just shouldn't HAVE to, know what I mean? I have found the same thing that it is crooked, sometimes I can square it up by cutting, but lose a lot of the panel. The panels made up of smaller blocks I have cut up, just to square them up. The term cheater does not mean a lot when you have to mess with cutting and squaring up, takes more time. Unfortunately will probably still pick them up, some of them are so darned nice.